We’re putting on our Easter Sunday best for this gathering of Easter egg hunts, church services, holiday meals, and more being held across the Myrtle Beach area. Mark your calendar with this checklist of events and gobble them up like a giant chocolate Easter bunny! Consider it our gift of sweet treats to you! Easter Egg Hunt, Belin Memorial United Methodist Church, 4182 Highway 17 Business, Murrells Inlet. Come one, come all at 10 am to hunt and gather hundreds of eggs packed with candy and goodies for infants and up, indoors and out. Craft tables, sweet treats and a visit from the Easter Bunny are also in store at this fun-filled event! 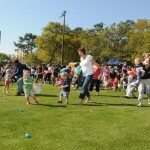 North Myrtle Beach Easter Egg Hunt, McLean Park. Fill your baskets with oodles of eggs hidden throughout the park, located at 93 Oak Drive in North Myrtle Beach. The hunt starts at 10 am and the Easter bunny will arrive to hand out candy between 10 am and noon. Hunt areas are divided by age groups, from infant to older. This is the 37th year of this North Myrtle Beach tradition, which also features additional children’s activities, refreshments and photos with Ms. Blossom (don your Easter bonnet to look picture-perfect!). Call 843-280-5584 for more info. Surfside Beach Easter Egg Hunt & Kids Fair, H. Blue Huckabee Complex. 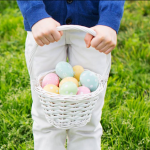 This outdoor festival eggstravaganza features a massive egg hunt for children 10 and under throughout the park at 499 Spanish Oak Drive, as well as live entertainment, inflatables, vendors, and food from 1-4 pm. Admission is free! For more info, call 843-650-9548. Breakfast with the Bunny, Hard Rock Café. 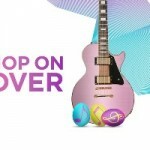 Rock on with the Easter Bunny at Hard Rock Café, Broadway at the Beach, where he’ll be the guest of honor at a hot breakfast buffet from 9-10:30 am. 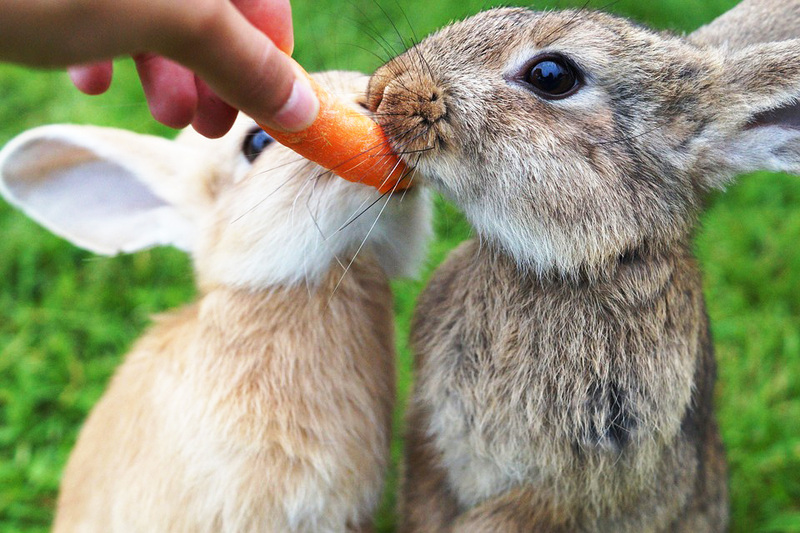 Kiddos will also love free Easter treats and free kids admission to Wonderworks! Call 843-946-0007 for more info. 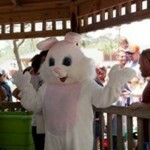 Plantation Resort’s Easter Egg Hunt & Easter Bunny Visit. On Friday, April 19th, the kids will have a blast searching for eggs at their favorite Resort. Ages 5 and under will meet at 9 am at the Lazy River. Ages 6 and up will meet at 9:30 am at the Outdoor Pool. Plantation Resort’s Easter Brunch. On Sunday, April 21, join us in the Activity Center from 8:30-11:30 am for a special Brunch menu. This menu replaces the regular breakfast menu (and includes some of the regular breakfast items) with such things as omelets, bagels, and fresh fruit. Spring Rock the Block & Egg Drop, 7485 Butler Road, Myrtle Beach. Hosted by Murrells Inlet-based Journey Church, this special Easter treat includes free food, fun games and hunts for kids of all ages from 3-5 pm. Easter Egg Hunt, First Baptist Church of Surfside, 711 16th Ave. North. Ready, set, hunt! 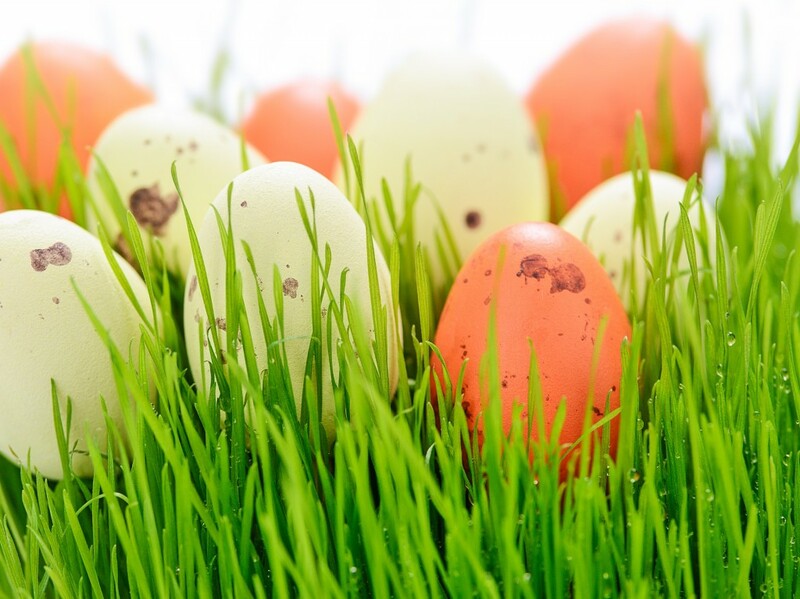 This fun-filled egg hunt is scheduled on the church grounds from 9-11 am. Easter Egg Hunt & Blessing of Easter Baskets, St. Michael’s Catholic Church, 542 Cypress Ave., Murrells Inlet. Peek a boo! 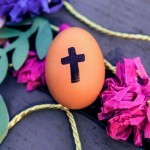 Hundreds of eggs will be hidden all over the church’s parking lots and grounds for you to fill your baskets from 9-11 am. Your baskets can then be blessed from 10:30-11 am inside the church. Belin Memorial United Methodist Church, 4182 Hwy. 17 Business, Murrells Inlet. Maundy Thursday worship service at 7 pm; Good Friday Fish Fry at 5 pm and service at 7 pm; Easter Sunday worship services at 6:30 am by the seawall for sunrise service, and 8:45 and 11 am in the traditional sanctuary and contemporary Harbor. The Church of the Resurrection, 8901 Highway 17 Bypass, Surfside Beach. Easter Sunday worship at 7 am, 9 am and 10:30 am. First Baptist Church of Surfside, 711 16th Ave. North, Surfside Beach. Sunrise service at Surfside Pier at 6:30 am and worship service at 11 am in the sanctuary. First Presbyterian Church, 1300 North Kings Hwy, Myrtle Beach. Maundy Thursday Communion at 7:30 pm; Good Friday Prayer Vigil from 9 am to 3 pm on Kings Campus; Easter worship services at 7 am (sunrise service at 60th Ave. North), 9 and 11 am in the sanctuary. First United Methodist Church, 901 North Kings Hwy, Myrtle Beach. Maundy Thursday worship and communion at 7 pm; Good Friday worship service at noon in the chapel; Easter worship services at 6:30 am at Plyler Park, and contemporary and traditional services at 10 am on the church campus. Surfside Presbyterian Church, 8732 U.S. 17 Bypass, Myrtle Beach. 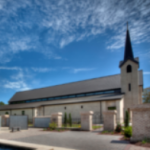 Contemporary Easter worship services at 8:30 am and 9:45 am and traditional worship service at 11:15 am. Surfside United Methodist Church, 800 13th Avenue North, Surfside Beach. 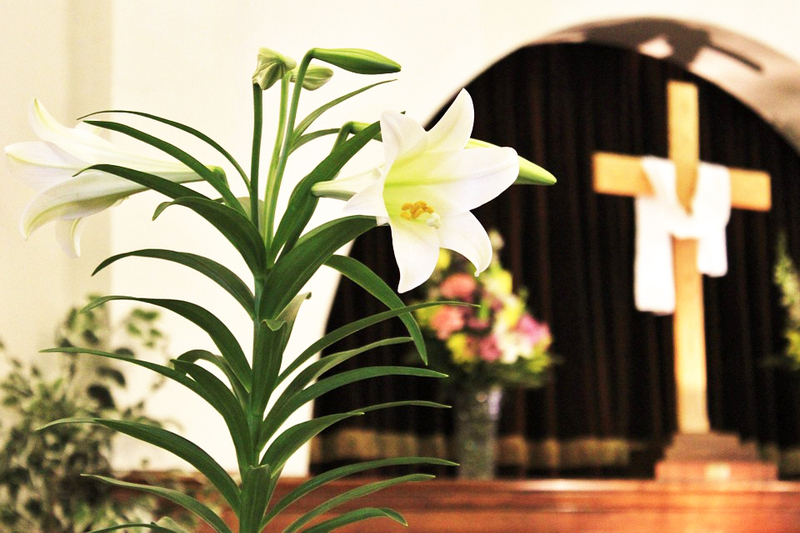 Maundy Thursday service at 7 pm; Good Friday service at 7 pm; and Easter sunrise service at 6:30 am, traditional worship at 8:30 with holy communion, and contemporary and traditional worship services at 11 am. St. Michael’s Catholic Church, 542 Cypress Ave., Murrells Inlet. Mass of the Lord’s Supper on Thursday at 6 pm and Holy Thursday Adoration at 7:30 in the Duffy Center; The Lord’s Passion at 3 pm and Stations of the Cross at 6 pm on Good Friday; and Easter Sunday Mass at 6 am, 8:30 am, and 11 am. Trinity Presbyterian Church, 2061 Glenns Bay Road, Surfside Beach. Maundy Thursday service at 6 pm; Good Friday service; Great Vigil of Easter at 6 pm; Easter worship service at 10:30 am. We’re dishing out where you can sit up to a glorious Easter dinner or fill up at an Easter buffet and brunch at just a sampling of restaurants up and down the Grand Strand. Can I get an Amen? Just click on the name for contact info and details. 21 Main at North Beach, 719 N. Beach Blvd, North Myrtle Beach. Make reservations for lunch. Bistro 90, 7209 SC-90, Longs. The restaurant will open from noon to 7 pm and reservations are requested. The Brentwood Restaurant & Wine Bistro, 4629 Luck Ave., Little River. Special menu for Easter Dinner from 11 am to 7 pm Call for reservations. Clark’s Seafood and Chop House, 720 Hwy 17 in Coquina Harbor, Little River. Reservations are recommended. Dead Dog Saloon, 4079 U.S. 17 Business, Murrells Inlet. Featuring an all-you-can-eat brunch buffet, mimosas and Bloody Marys starting at 9 am. Gulfstream Café, 1536 S. Waccamaw Drive, Garden City. Serving an Easter brunch buffet from 8 am to 2:30 pm, including a carving station and build-your-own omelet station. Hook & Barrel, 8014 N. Kings Highway, Myrtle Beach. Join the restaurant for a delicious Easter buffet from 9 am to 8 pm. House of Blues, 4640 Hwy 17 S, North Myrtle Beach (Barefoot Landing). Get a seat at House of Blues’ world-famous Gospel Brunch, with seatings available from 9 am to 1:30 pm. Reservations are recommended. Salt Water Creek Café, 4660 Hwy 17 Bypass, Murrells Inlet. Brunch will be served from 10 am to 2 pm. Sea Captain’s House, 3002 N. Ocean Blvd., Myrtle Beach. Brunch buffet will be served from 10:30 am to 2:30 pm and regular breakfast and lunch menus of their traditional favorites (including their signature Crab Cakes Benedict) will also be available. Sticky Fingers Smokehouse, 2461 Coastal Grand Circle, Myrtle Beach. Serving an all-you-can-eat barbecue buffet from 11 am to 3 pm. The Melting Pot, 5001 N. Kings Hwy, Myrtle Beach. Brunch is served from noon to 3 pm. Reservations are suggested. Travinia Italian Kitchen, 4011 Deville St., Myrtle Beach (The Market Common). Celebrate Easter with Italian specialties. Tupelo Honey, 3042 Howard Ave., The Market Common, Myrtle Beach. Celebrate Easter dinner, Southern-style. Waterscapes Restaurant at Marina Inn Grande Dunes, 8121 Amalfi Place, Myrtle Beach. Call for reservations. All of these are just a short drive from Plantation Resort. To reserve your stay at Plantation Resort, be sure to call one of our friendly Owner Services Representatives at 1-800-845-5039.